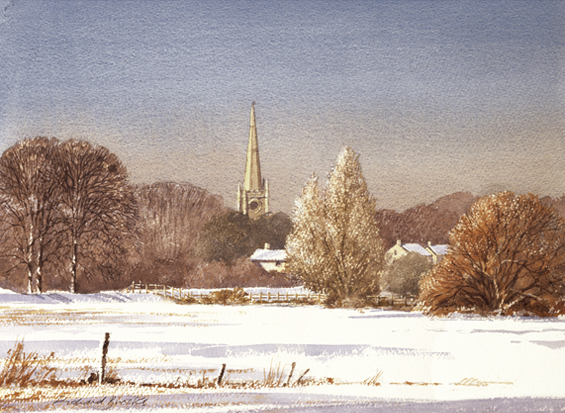 Snow scene of a rural landscape with church spire in the distance. This is a companion painting to 'After the Rain' which is a similar viewpoint in summer. Both are from original watercolour paintings reproduced as a Giclee print on German Etching paper, signed limited edition of 90, each print is supplied with a certificate of authenticity. Print sizes 45 available approximately 14inches by 10inches or 36x26cm excluding mount. As a single picture mounted, cellophane wrapped and ready to frame �69.00 plus postage and packing. As a pair when ordered together with 'After the Rain' special discount available of 10% off for ordering both on same order �130 the pair.